Back in 2009 Google executives were scared of not being able to retain talent with stock options after Google’s stock price cratered with the rest of the market & Google’s ad revenue growth rate slid to zero. That led them to reprice employee stock options. That is as close as Google has come to a “near death” experience since their IPO. They’ve consistently grown & become more dominant. In November of 2009 I cringed when I saw the future of SEO in Google SERPs where the organic results were outright displaced & even some of the featured map listings had their phone numbers removed. It isn’t surprising Google greatly devalued keyword domain names & hit sites like eHow hard. And it isn’t surprising Demand Media is laying off staff and is rumored to be exploring selling their sites. If deleting millions of articles from eHow doesn’t drive a recovery, how much money can they lose on the rehab project before they should just let it go? Over time SEO became harder & less predictable. The exception being Google investments like Thumbtack, in which case other’s headwind became your tailwind & a list of techniques declared off limits became a strategy guidebook. Communications got worse, Google stopped even pretending to help the ecosystem, and they went so far as claiming that even asking for a link was spam. All the while, as they were curbing third party investment into the ecosystem (“deny them money”), they work on PR for their various investments & renamed the company from Google to Alphabet so they can expand their scope of investments. It takes a lot of effort & most people are probably too lazy to do it, but if you look at the arch of Google’s patents related to search quality, many of the early ones revolved around links. Then many focused on engagement related signals. Chrome & Android changed the pool of signals Google had access to. Things like Project Fi, Gogle Fiber, Nest, and Google’s new OnHub router give them more of that juicy user data. Many of their recently approved patents revolve around expanding the knowledge graph so that they may outright displace the idea of having a neutral third party result set for an increasing share of the overall search pie. Searchers can instead get bits of “knowledge” dressed in various flavors of ads. This sort of displacement is having a significant impact on a variety of sites. But for most it is a slow bleed rather than an overnight sudden shift. In that sort of environment, even volunteer run sites will eventually atrophy. They will have fewer new users, and as some of the senior people leave, eventually fewer will rise through the ranks. Or perhaps a greater share of the overall ranks will be driven by money. Most likely the relationship *is* quite direct, but there is a lagging impact. Today’s major editors didn’t join the site yesterday & take time to rise through the ranks. As the big sites become more closed off the independent voices are pushed aside or outright disappear. There has been a general pattern in search innovation. Google introduces a new feature, pitches it as being the next big thing, gets people to adopt it, collects data on the impact of the feature, clamps down on selectively allowing it, perhaps removes the feature outright from organic search results, permanently adds the feature to their ad units. This sort of pattern has happened so many times it is hard to count. Google puts faces in search results for authorship & to promote Google+, Google realizes Google+ is a total loser & disconnects it, new ad units for local services show faces in the search results. What was distracting noise was removed, then it was re-introduced as part of an ad unit. The same sort of deal exists elsewhere. Google acquires YouTube, launches universal search, offers video snippets, increases size of video snippets. Then video snippets get removed from most listings “because noise.” YouTube gets enlarged video snippets. And, after removing the “noise” of video stills in the search results Google is exploring testing video ads in the search results. 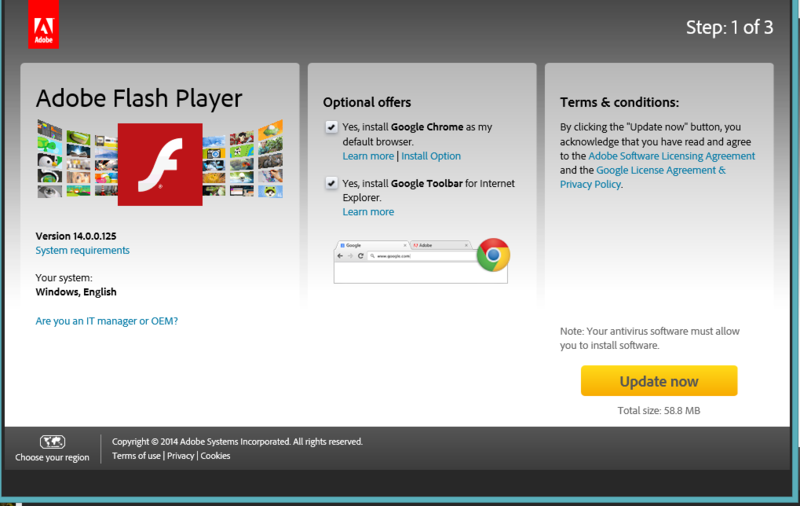 Of course, it goes without saying that much of the Google Chrome install base came from negative option software bundling on Adobe Flash security updates. Google claimed helpful hotel affiliate sites should be rated as spam, then they put their own affiliate ads in hotel search results & even recommended hotel searches in the knowledge graph on city name searches. Google created a penalty for sites which have an ad heavy interface. Many of Google’s search results are nothing but ads for the entire first screen. Google search engineers have recently started complaining about interstitial ads & suggested they might create a “relevancy” signal based on users not liking those. At the same time, an increasing number of YouTube videos have unskippable pre-roll ads. And the volume of YouTube ad views is so large that it is heavily driving down Google’s aggregate ad click price. On top of this, Google also offers a survey tool which publishers can lock content behind & requires users to answer a question before they can see the full article they just saw ranking in the search results. Amid the growing ecosystem instability & increasing hypocrisy, there have perhaps been only a couple “blue ocean” areas left in organic search: local search & brand. And it appears Google might be well on their way in trying to take those away. For years brand has been the solution to almost any SEO problem. But Google has been increasing the cost of owning a brand. They are testing other ad formats to drive branded search clicks through more expensive ad formats like PLAs & they have been drastically increasing brand CPCs on text ads. And while that second topic has recently gained broader awareness, it has been a trend for years now: “Over the last 12 months, Brand CPCs on Google have increased 80%” – George Michie, July 30, 2013. Google has recently dialed up monetization of local search quite aggressively as well. I’ve long highlighted how mobile search results are ad heavy & have grown increasingly so over time. Google has recently announced call only ad formats, a buy button for mobile ads, local service provider ads, appointment scheduling in the SERPs, direct hotel booking, etc. And, in addition to all the above new ad formats, recently it was noticed Google is now showing 3 ads on mobile devices even for terms without much commercial intent, like [craft beer]. Earlier this month it was also noticed Google replaced 7-pack local results with 3-pack local results for many more search queries, even on desktop search results. On some of these results they only show a call button, on others they show links to sites. It is a stark contrast to the vast array of arbitrary (and even automated) ad extensions in AdWords. Why would they determine users want to see links to the websites & the phone numbers, then decide overnight users don’t want those? Why would Google determine for many years that 7 is a good number of results to show, and then overnight shift to showing 3? If Google listed 7 ads in a row people might notice the absurdity of it and complain. But if Google only shows 3 results, then they can quickly convert it into an ad unit with little blowback. You don’t have to be a country music fan to know the Austin SEO limits in a search result where the local results are now payola. 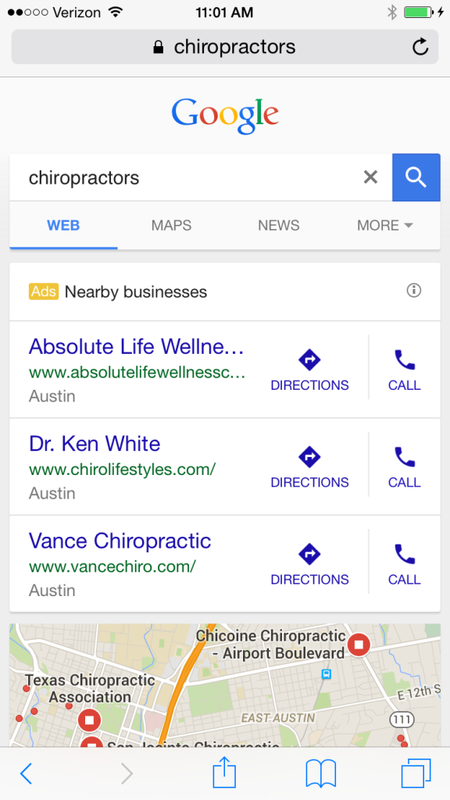 Try not to hurt your back while looking down for the organic search results!